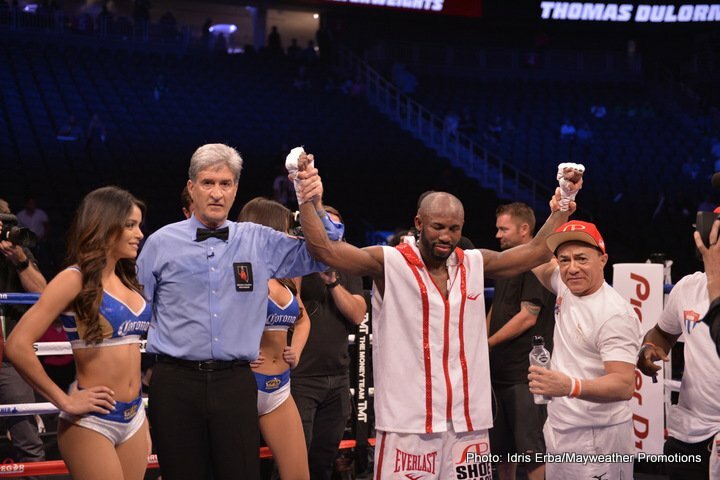 Welterweight contender Yordenis Ugas (20-3, 9 KOs) took home a unanimous decision victory over Thomas Dulorme (24-3, 16 KOs) despite being knocked down in Mayweather vs. McGregor preliminary action presented by Mayweather Promotions on FOX and FOX Deportes Saturday night from T-Mobile Arena in Las Vegas. Both men looked to establish their jab in round one but in round two Ugas landed a big uppercut that stunned Dulorme and forced him to take a knee. Dulorme rose to his feet and tried to fire back but was hit with a right hand that put him down for the second time in the round. “It was a good fight,” said Dulorme. “It was a very tough fight. I came to fight and I took him seriously. I kept working. It was up and down but I kept working. The bout was defined by good back and forth action with both men having their moments in control. Dulorme was committed to attacking the body to slow Ugas but was given a warning for low blows in the fifth round. Dulorme continued to test the body however and strayed too low early in the seventh round, forcing referee Vic Drakulich to deduct a point. The deduction seemed to light a fire under Dulorme who pushed forward and began to break through the defense of Ugas. An uppercut temporarily stunned Ugas midway through the round and Dulorme followed up shortly after with a left hook that put Ugas on the canvas. The momentum of the fight continued to swing heading into the final round when Dulorme again delivered a low blow that forced the referee to deduct a point early in the frame. Both men pressed forward for the final minutes of the fight looking to score another decisive blow but after 10 rounds the fight was left up to the judges. All three judges saw the bout in favor of Ugas by scores of 94-91 and 93-92 twice. The opening bout of the telecast saw Juan Heraldez (13-0, 8 KOs) box his way to a unanimous decision over Jose Miguel Borrego (12-1, 11 KOs) in their 10-round welterweight fight. Heraldez controlled the ring for much of the fight with his jab and movement on the outside, while Borrego appeared focused on delivering power shots and a knockout. Heraldez controlled the pace in the first few rounds, landing scoring combinations before darting out of the way and avoiding Borrego’s return fire. The 19-year-old Borrego was content to cover up and duck low while trying to navigate through Heraldez’s jab, but was unable to land enough left hooks to win early rounds in the fight. He had his first moment at the very end of the sixth when a looping left hook connected clean with Heraldez and appeared to stun him right before the bell ended the round. Borrego continued to attack aggressively as he chased Heraldez with big power punches. In round nine Borrego connected cleanly with a left hook that put Heraldez on the mat midway through the round. “I let myself get distracted and that’s why I got knocked down,” said Heraldez. I got a little ahead of myself. I’m the only person who can stop myself. Despite Borrego’s continued aggression, Heraldez was able to hold on and survive the round without much further damage. The final round saw Heraldez return to using his movement as he was able to avoid the charging Borrego for the last three minutes. After 10 rounds, all three judges scored the bout in favor of Heraldez by scores of 96-93 and 97-92 twice.